Was your custom portrait painting a gift for someone else or for yourself? 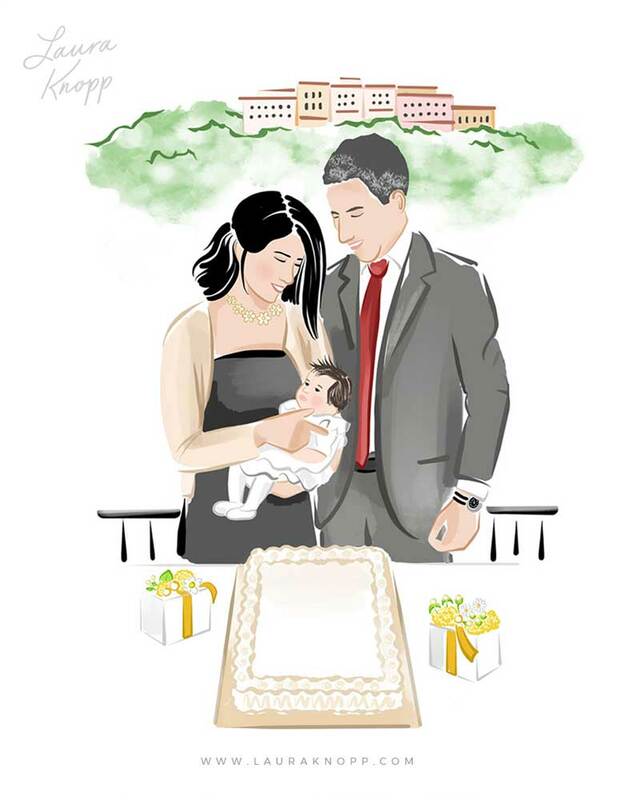 The portrait is a gift for my husband, to celebrate his first Father's day. What makes the photo you asked me to draw special to you? This is a photo of us as a new family - at a party we threw to celebrate the birth of our first daughter. My little girl was only 2 months old here and we were tired (since we hadn’t slept for many days). But, I can see the happiness in our eyes! What do you like the most about your final custom portrait illustration? The style is what I like the most because it is informal, lively and spontaneous just like our family! I've always liked portraits, I love art and when I visit museums I always look at paintings with a lot of interest. Now we have digital photos, but being able to shoot pictures endlessly means we never stop and reflect on what they represent. This custom portrait service is the possibility to stop and choose a photo that represents you. If you're interested in a custom family portrait of your own, you can click here to get one!